This section contains a summary of case history, products and solutions developed. The MULTIVISION system provides a Color-to-Color automatic register adjustment and control based on a multiple camera scanning system. It controls both machine and cross side of each single printing unit in real time (printing velocity up to 200m/min). 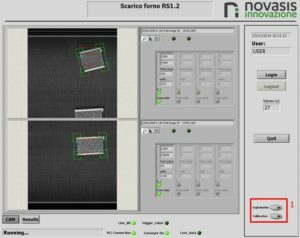 The system is entirely manufactured at the Novasis Innovazione facilities and is supplied pre-calibrated to allow quick installation in every machine. The application measures the 3D position of the engine flywheel and give the coordinates to a collaborative robot for its trajectory adjustment and the correct sealant dispense. The application system is also able to inspect the sealant bead to ensure the correct placement, size and shape. The system comprises an electrical cabinet, industrial PC, monitor and connectivity (to PLC and for remote assistance). The thermographic measurement system is based on two thermal camera that are installed next to the welding station. The machine vision system is based on two linear cameras, telecentric lenses and laser illumination. Saw beads coordinates are communicated to two KUKA robots for the pick and place of only good pieces. Two linear cameras and illumination systems are placed inside a mechanical isolated gate installed on the production conveyor line. 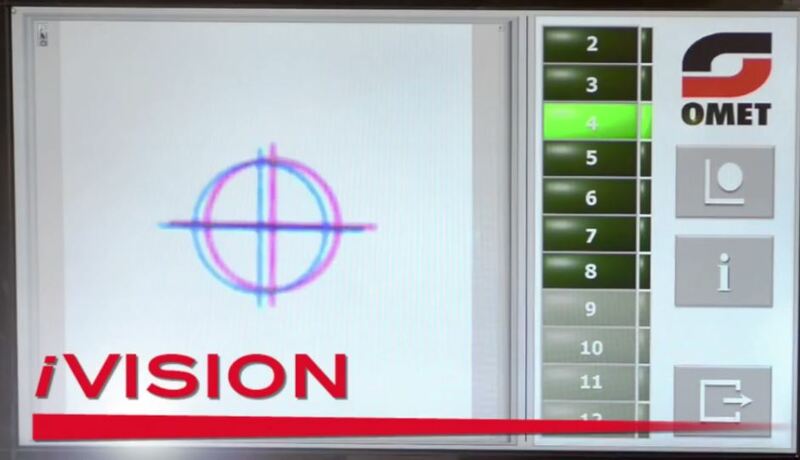 The vision system is able to automatically detect holes, creases, bubbles, etc. communicating to the line PLC for sorting. The system is inclusive of a vibrating feeder, conveyor line, machine vision system and pneumatic sorting. The machine vision system performs the morphological and presence/absence checking of plastic springs at 150 pcs/min rate. The machine vision system is based on three cameras, three backlight illuminators, industrial PC, electrical cabinet with monitor for the morphological checking of hand brake levers mechanism on production line. 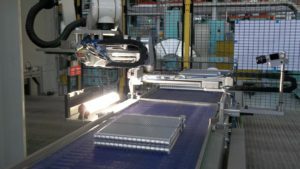 The vision system recognizes the embossed code on the evaporator flank (hollow binary code) and communicates it to the production line control PLC via Industrial Ethernet. The vision system must provide the robot with the coordinates (x, y) of the evaporator position to be picked up on the belt, the rotation relative to its center (θ), the distance between the sides (W) and the pick-up condition (proximity or overlapping). All this information is sent to the PLC (via S7 protocol) and directly to the robot for the conveyor tracking synchronization signal. In addition to the power board where the PC is compiled. The system consists of two linear cameras with respective lens, two LED illuminators and a portal support structure. 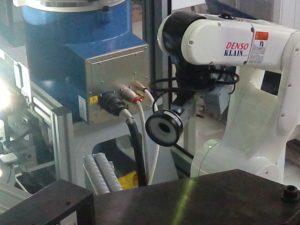 The vision system has the function of guiding the robot during insertion into the connection of the sealed test gripper. 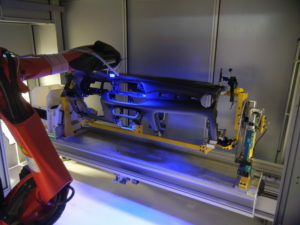 The system consists of a camera equipped with a high-resolution monochrome sensor, a suitable optic and a circular led illuminator positioned by means of special brackets on the robot’s wrist. 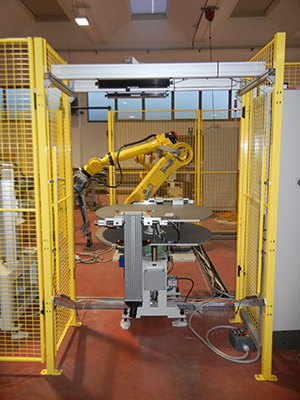 The system, by moving the camera on a robot pulley, calculates the robot path for subsequent approximations by providing the x, y, z information for centering the caliper. The interaction between robots and vision system is direct. 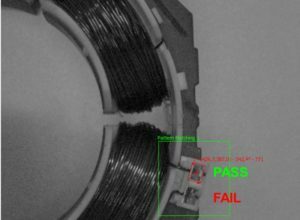 For communication, we rely on the PLC to enable / disable the vision system, inspection result, shift offset. 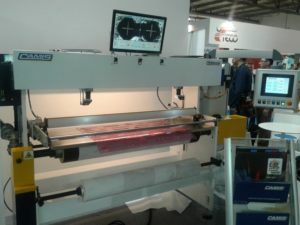 The application consists of a multi-camera system, integrated on-board injection molding machine, for inspecting cable tie straps of different colors and for managing the results of the inspection (pass/fail) of a printed ties. 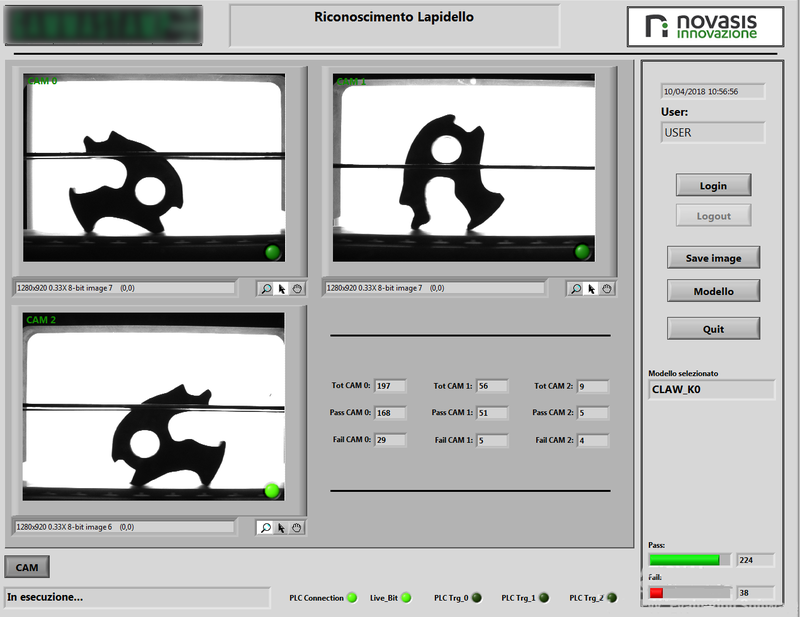 You can also save captured images and modify the parameters for managing waste prints. 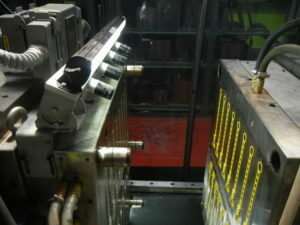 The system is suitable for integration on all molding machines and is an example of integration on standard production machines that can be replicated and usable as an additional tool, not only for users but also for machine manufacturers. The display system for two cameras (GigE or USB3.0) allows customization of the UI. The software is able to: Manage pre-defined ROIs and patterns on images, work files, generate reports, allow alignment between camera image and user-set reference, and measure any defects starting from a simple calibration process, optical zoom and digital zoom, etc. The task of the iVision system is to recognize a reference graphic, or cross-mark, printed in various colors on a glossy white paper. The system consists of “vision heads” (one for each print roller, made up of a plastic casing inside which there is a lens camera and an ad hoc illumination designed to be integrated into the machine. The visual system, in addition to the “optical group”, is complemented by an industrial PC on which the image processing program with dedicated graphic interface is installed. 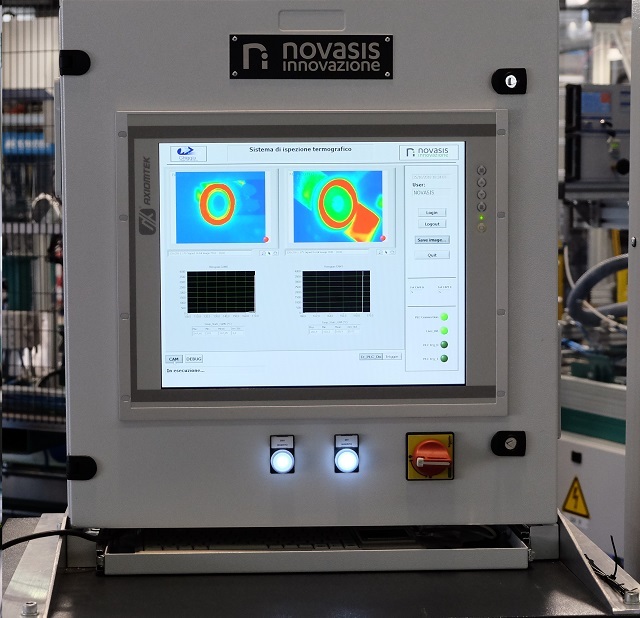 The system is entirely manufactured at the Novasis Innovazione facilities and is supplied pre-calibrated to allow quick installation in every machine. The application allows you to check the presence or absence of clamps intended to be securing screws and anchor inserts for the details that will be mounted later to complete the dashboard. The vision system is comprised of an “optical group” (camera, optics, illuminator) mounted on the robot wrist, and is complemented by an electrical cabinet containing an industrial PC on which the image processing program is installed. The PC communicates with the S7 protocol to the PLC that manages the line. The vision system allows you to work in continuous moving mode (captured image while the robot is in motion) for cycle time optimization. 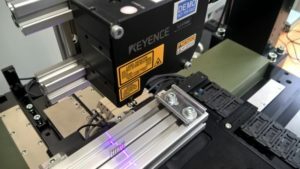 The system consists of a 3D laser head (laser blade) that guarantees, acquiring 32kHz, up to 200mm to 4m / s. The system is supplied with an electrical cabinet with laser controller, industrial PC and interface for communication with the line PLC. The vision system consists of a high-resolution matrix camera and a backlighting system. 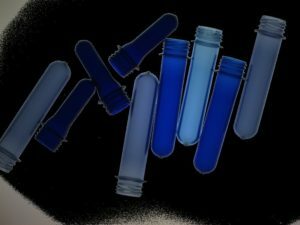 Dedicated image processing algorithms allow to statistically evaluate color and shape variations by means of thresholds. The application consists of a rotating table in which two stations are dedicated to controlling stator defects with 5s cycle time. The inspection is done with three matrix cameras, in a fixed position and a ring illuminator for each camera. The system is supplied complete with electric panel and custom user interface. The system consists of 2 “vision heads” arranged in succession, for the simultaneous analysis of two punteries. The heads consist of a compact optic set (camera, lens, illuminator) connected to a signal amplifier. The vision system is complemented by an industrial PC, which houses the PLC communication protocol program and the image visualization interface.